Nothing satisfies like Nonna's stew... you can taste the hours she spent in the kitchen, mixing classic Italian ingredients with love and care. But you're not her, and you've got work today. This satisfying all-included slow cooker meal requires no prep work and no follow up - just add it your slow cooker in the morning and head out. When you come home, the house will smell amazing and dinner will be ready. 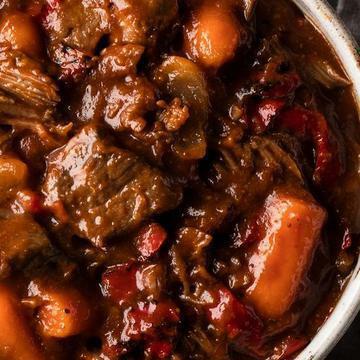 Our Rustic Italian Beef Stew starts with rich sirloin, which braises for hours to tenderness in a blend of Burgundy wine and beef stock, fire-roasted tomatoes, smoky, savory bacon, onions, carrots, and roasted red peppers. Feeds a family of four to eight. Instructions based on 6-quart slow cooker. Appliances vary; adjust cook time accordingly. Do not thaw. Keep frozen until ready to cook. Remove contents from box. Carefully open bag with vegetables and remove sauce pouches. Place beef and sauce pouches under cold water to loosen film. Open beef pouches and place beef in slow cooker. Wash hands thoroughly after handling raw beef. Open sauce pouches and add sauce, � cup water and vegetables to slow cooker. Cover and cook on LOW for 8 hours or HIGH for 6 hours. Stir and serve. Ingredients: Beef Sirloin, Tomatoes (Tomatoes, Citric Acid), Water, Baby Carrots, Onions, Uncured Bacon (Pork, Salt, Turbinado Sugar, Seasoning [Cultured Celery Juice Powder, Sea Salt]), Fire Roasted Red Peppers, Burgundy Cooking Wine (Burgundy Wine, Salt), Garlic Puree, Sea Salt (Sea Salt, Potassium Chloride, Magnesium), Rendered Bacon Fat, Modified Corn Starch, Spices, Beef Broth Flavor (Beef Broth [Salt], Natural Flavor).